Giuseppe DiFranco first appears in the Painesville, Ohio, area in 1919. In America, Giuseppe DiFranco was known as Joseph DeFranco. Giuseppe DiFranco, son of Carmen DiFranco and Lucia DiVincenzo, was born on October 24, 1886, at Rionero Sannitico, Italy. He married Minnie Julia Frate, daughter of Antonio Frate and Maria Silvestro, on May 28, 1914 at Cleveland, Cuyahoga County, Ohio. Giuseppe died on May 24, 1966, at his home, 6282 Auburn Road, Concord Township, Lake County, Ohio, at age 79. His body was interred at St. Mary Cemetery at Painesville Township, Lake County, Ohio. Giuseppe DiFranco immigrated to the United States in 1900. Mr. DiFranco started into business as a contractor in Cleveland in 1913. He became a sewer contractor in 1924, retiring in 1956. 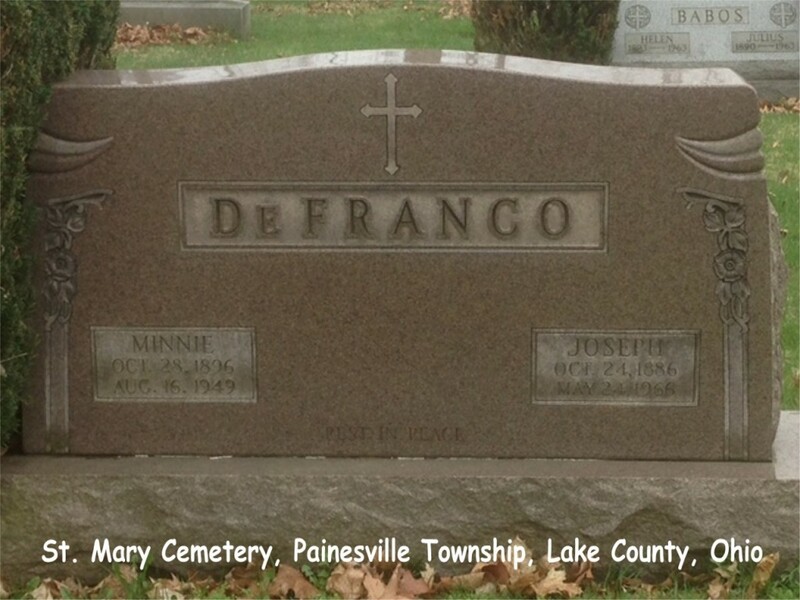 Giuseppe DiFranco’s brother, Sabatino DiFranco, lived in Painesville from 1918 until his death in 1985. 1. Elizabeth Ann DeFranco was born in 1915, at Ohio. She married Harold L. Davis. Elizabeth died in 1962. Her body was interred at St. Mary Cemetery at Painesville Township, Lake County, Ohio. 2. Frederick DeFranco was born about 1917, at Ohio. 3. Lucille DeFranco was born about 1919, at Ohio. She married Louis W. Lang. Lucille died in 1988. Her body was interred at Riverside Cemetery at Painesville, Lake County, Ohio. 4. 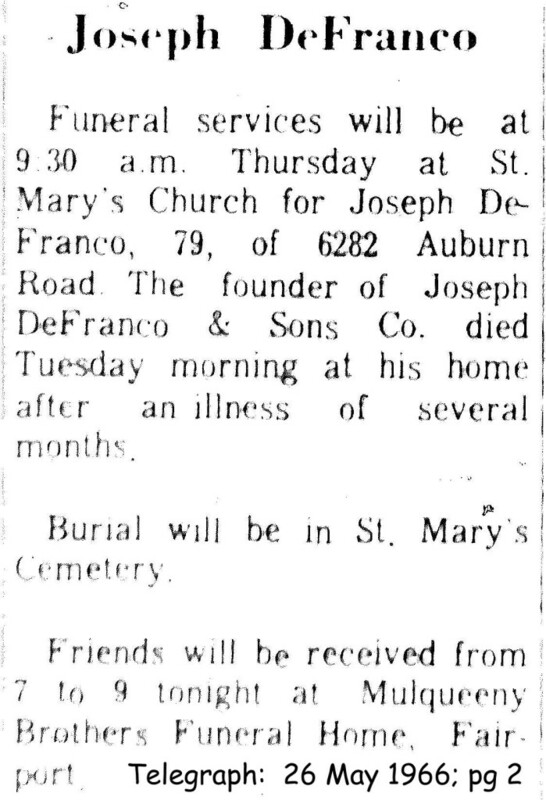 Joseph F. DeFranco Jr. was born on May 14, 1922, at Ohio. Joseph died on November 5, 1999, at age 77. His body was interred at Riverside Cemetery at Painesville, Lake County, Ohio. 5. Rita Marie DeFranco was born on October 29, 1924, at Painesville, Lake County, Ohio. She married Stephen Nagy II. Rita died on September 20, 2005, at Heartland of Mentor, Mentor, Lake County, Ohio, at age 80. Her body was interred at Riverside Cemetery at Painesville, Lake County, Ohio.